ChefSlime Eye Slime Cool Putty!! Sweet Deal!! JUMBO PACK OF 48 PCS - You will receive 48 Different colors super slimes in your package, with .5 OZ of slime per pack. STRESS RELIEF - Great for adults and kids to HELP WITH CONCENTRATION, and relieve stress, from school, home or work by squeezing stretching and pulling the slime. 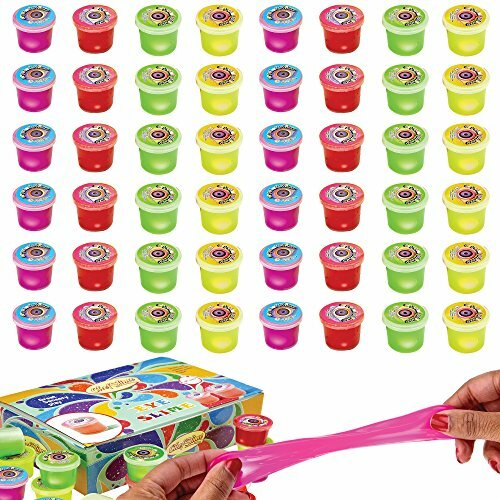 SUPER FUN FOR KIDS - ChefSlime will make a great party favor & great sludge toy for kids to play with, and have fun with! SURPRISE EYEBALL INSIDE EACH CONTAINER - Everyone loves surprises! You child will be surprised to find an eyeball inside its jar while squeezing and playing around with it. It will give playing with slime a new and exciting twist! NON-TOXIC 100% SAFE - ChefSlime is manufactured with environmental friendly material. It is ASTM,CPC Certified, making it Completely safe for Kids and Adults.